Friends, colleagues and family came out to salute one of Fulton County’s longest-serving commissioners Dec. 29 as Paul Barnaby said good-bye. Barnaby has been a commissioner since 2000 and decided to retire at the end of his fourth term. He has no immediate plans, he said. Fulton County hosted the party held on the second floor of the administration building in Wauseon. Several department heads and a couple of dignitaries were among those who came to pay their respects. The event was as bubbly as Barnaby who walked around the room and introducing various people to the audience. Barnaby was in his glory as recalled the significance of each person to his life. Some were former students, others family members and others former commissioners. Barnaby’s smile was infectious as he worked the room, getting everyone to grin. Each person responded in kind with warmth and best wishes for the future. 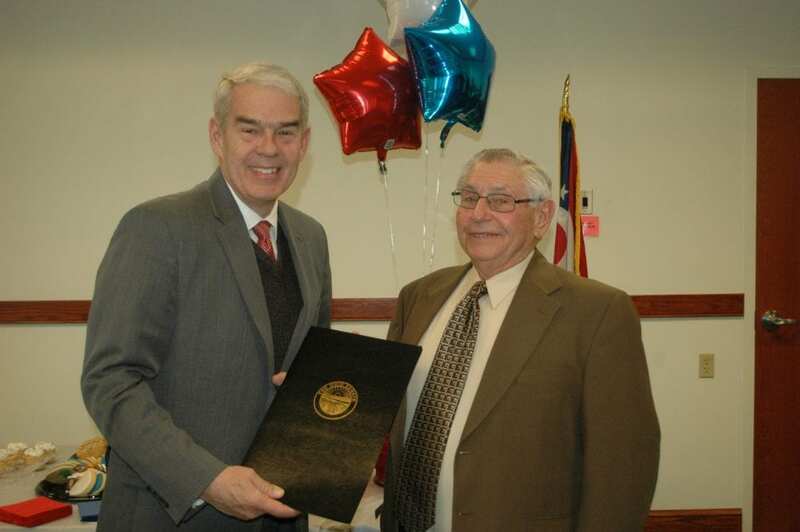 Barnaby received two honors: one from State Sen. Randy Gardner and the other from U.S. Rep. Latta who presented him with a U.S. flag that flown over the Capitol. Gardner praised Barnaby’s time as a agriculture teacher with a focus on the dairy side. The Wood County resident said of the five counties, 360,000 residents and nearly 1,000 governmental entities in his district, Barnaby holds a special place. “I can’t think of anyone I have more respect for than Paul Barnaby,” Gardner said. Barnaby’s absence will be felt for those who are staying on. “I’ve worked with Paul for 16 years,” County Administrator Vond Hall said, who said Barnaby has been the longest sitting commissioner since he’s been with the county. “It will be a new day; it will definitely be a different day. On a personal and professional level, Hall said Barnaby was both a mentor and a father figure. Be the first to comment on "Fulton County Says Goodbye To Commissioner Paul Barnaby"